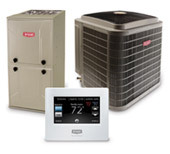 As a full service HVAC contractor in business since 1997, we offer a complete range of plumbing services in Peterborough and the surrounding area. Whether it’s plumbing repairs or the installation of a new system, we take a thorough step-by-step approach to review and assess your individual needs. Our professionally trained uniformed plumber will come to your home or business to diagnose the issue or requirements and recommend the best options to address your specific situation. Our services range from small one-time repairs to replacing all or most of the current plumbing; we also do new installations, for example if adding a bathroom to the basement or when building a new house. From commercial plumbing to cost-effective reverse osmosis systems and water softeners, Boyle has the trained professionals to suit the job. Like all services, our plumber’s work is fully guaranteed and we offer no obligation estimates on all installation work. Professional uniformed service, free estimates, and guaranteed work with quality products at a price that’s reasonable. Contact us now for your next Peterborough area plumbing repair or installation!